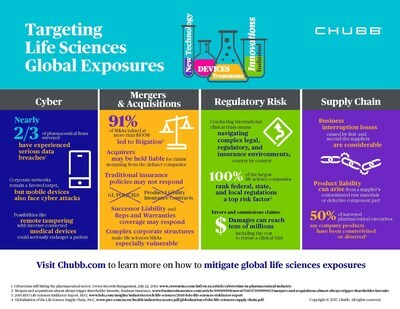 WHITEHOUSE STATION, N.J., June 14, 2017 /PRNewswire/ -- Life sciences companies need to understand the potential vulnerabilities they face when entering international markets, as well as the risk transfer strategies available to help mitigate those risks, according to a new Chubb advisory, "Innovation and Global Competition Add Risk to Life Sciences Industry. " The advisory, co-authored by Lee Farrow, Executive Vice President and Chubb's Life Sciences Industry Practice Leader, and Frank Goudsmit, Senior Vice President within Chubb's Life Sciences Industry Practice, highlights the threat of cyber breaches, supply chain interruptions, merger and acquisition liabilities, and regulatory hurdles as among the most critical risks and exposures facing an increasingly globalized life sciences industry. "These exposures are amplified by the increasingly global nature of the life sciences industry," said Farrow. "Life sciences companies are continually innovating products and technologies to help treat diseases worldwide. However, with these rapid advancements come complex exposures that can have serious financial and reputational impacts if not appropriately addressed." "As life science companies continue to grow, they are likely to find themselves in the international arena," added Goudsmit. "The same global viewpoint that embraces development, suppliers, products and sales should extend to insurance as well. One size does not fit all, so it is important companies work with a knowledgeable partner to understand the associated exposures and the right coverages to supplement existing risk mitigation strategies," he continued. The full advisory can be read here.